Adults, especially adults carrying children, have built whole routines around the opening of car doors and liftgates. Putting kids or groceries down to open doors is a chore that requires even more work afterward to lift the children or objects from the ground and into the vehicle. 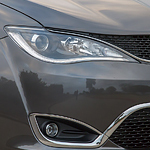 Chrysler engineers developed an unlooked-for answer that will satisfy every parent out there. Both the sliding side door and the rear liftgate are equipped with sensors beneath the chassis of the vehicle that activate two motors—one to unlatch the connectors and the other to open the doors. The convenience is quickly becoming a necessity in Falmouth where parents watch others stick a foot under the frame of their Pacifica, and the door magically opens. At Pothier Motors Limited, our technicians are certified to maintain the doors on a Pacifica and the motors that run them.